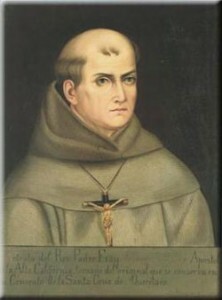 Today Junipero Serra, a Spanish Franciscan and founder of nine of the twenty-one California missions in the 18th century, was declared a saint by Pope Francis at a solemn Mass at the Basilica of the Immaculate Conception in Washington, D. C. The canonization of Junipero Serra is a call to personal holiness and evangelization. The saints brought the Catholic Faith to these lands and they taught us by their example of charity and self-sacrifice how to plant the seed of the Gospel. St. Junipero respected and loved the indigenous people. He spent himself in their service. He founded nine of the missions of Alta California for various Indian tribes. He gave up his university teaching on the island of Mallorca to evangelize the New World teaching the simple and poor the Good News. This is what St. Francis Xavier would challenge the university professors of Paris to do, and he himself did in India and Japan. Vatican II reminds us of the universal call to holiness and apostolate. The Lord continues to call us in the 21st century to be his apostles. Many people are waiting for us to share with them the truth about God, man and the world. We must hear God’s call and respond generously, putting aside laziness, human respect and fears. Each one must consider where God has placed him and what he asks; some are asked to leave their professional calling to serve God, but most of us, instead, must serve God through our profession, and especially in the education of young people. St. Junipero faced countless privations, but did not hold back from his mission. On foot, despite his trouble walking, the heat and dangers of paths, he traveled up and down California. Today’s canonization Mass presided by Pope Francis was in various languages including a reading in an indigenous tongue but with a predominance of Spanish, the tongue of this brave and selfless saint. The Holy Father began the homily using St. Paul’s words: rejoice in the Lord always. Although the pope looked tired, speaking in Spanish he invited us to seek true happiness; his very presence is a wonderful testimony of joy for us. The pope invites us to be careful that our hearts not become anesthetized, becoming accustomed to the Gospel. Jesus told the disciples of yesterday and today: Go and announce the Gospel. We find joy by giving, giving of ourselves. The source of our joy is based on our experience of God’s infinite mercy. The joy of the Christian is found by announcing the Gospel. We experience sin, sorrow and weakness but God wants us to go and announce the loving embrace of the Father, the madness of a Father who wishes to anoint with the oil of hope. The pope tells us that the mission does not arise from a perfect plan but from having experienced God’s healing and love. The faithful people of God must go out of itself. We are here because of a chain of witnesses. Today we recall one of those witnesses. He is part of the Church that knows how to travel the paths of the world. Junipero left his land to do this, and he protected and served the Indians. He was moved by the maxim: siempre adelante (always forward). He did not allow his heart to be anesthetized. He went forward. The pope invites us to the same. We await the day the Church will also raise Blessed John Henry Newman to the list of saints. He was called to sanctify the world of secondary and higher education. Today so many universities throughout the world are places where youth lose their faith and morals. Newman’s teaching helps students to discover the harmony between faith and reason, and to pursue the truth with honesty, spending their lives in God’s service. Each one of us, working like St. Junipero Serra with simple people, or like Blessed John Henry Newman and St. Josemaría Escrivá with university students, must heed the Lord’s call to announce the Gospel.